What better way to spend an Easter Holiday weekend than to take a ride in the park. 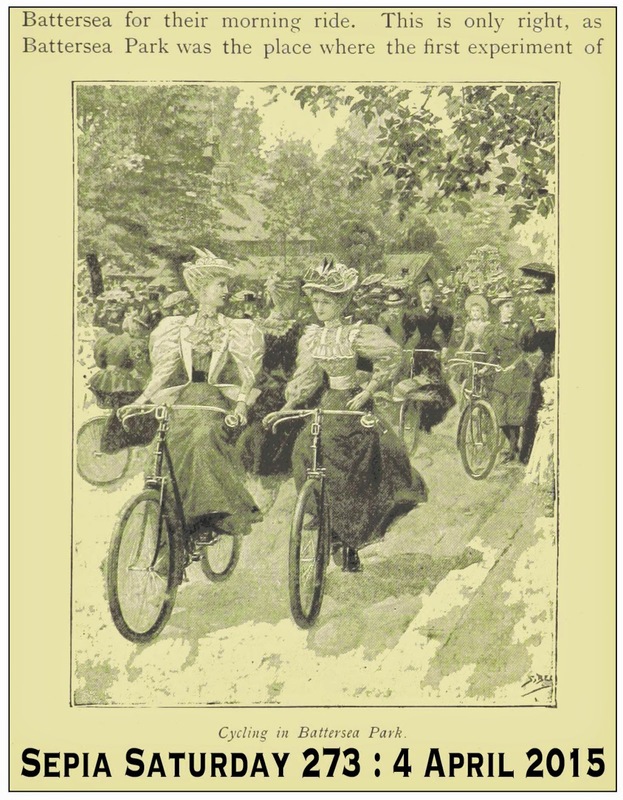 These ladies are enjoying a Springtime ride in Battersea Park - but whether it is Central Park or Waterfront Park, Myers Park or La Fontaine Park, it makes no difference if you want to join in the fun. 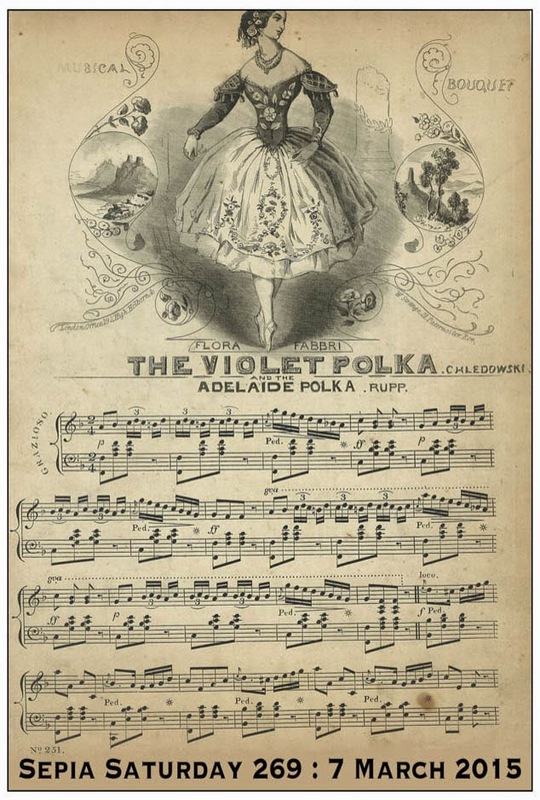 Just choose an old image - either connected to the theme image or not - and share in in a Sepia Saturday post. Post your post on or around Saturday 4th April 2015 and add a link to the list below. Our theme image comes from the British Library collection on Flickr Commons and is taken from a book entitled "The Municipal Parks, Gardens and Open Spaces of London" So as a sepia Easter present you have a range of potential themes to follow - cycling, parks, long skirts, book and newspaper illustrations - the choice is yours. Before you push off - so to speak - take a look at what our next couple of themes are so you can be ready to recycle an appropriate old image. So have a great Easter and get those sepia cycles on the road. We seem to be on a transport thing at the moment. There were horses last week, tractors this week and bikes next week. But just a little imagination can turn a drinking horse into a pub, a tractor into a potato, and a bicycle into a pair of pretty women. 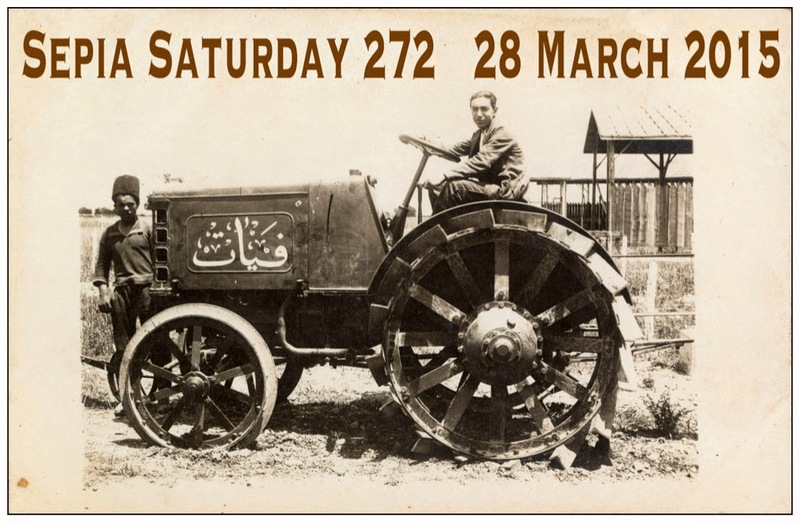 Our theme image comes from the collection of the SALT Institute in Istanbul, Turkey (featured on their Flickr Stream) and dates back to 1924 and shows a powerful looking tractor at an International Agricultural Fair in Adana, Turkey. You can go wherever you want to with this image (and indeed with this tractor). 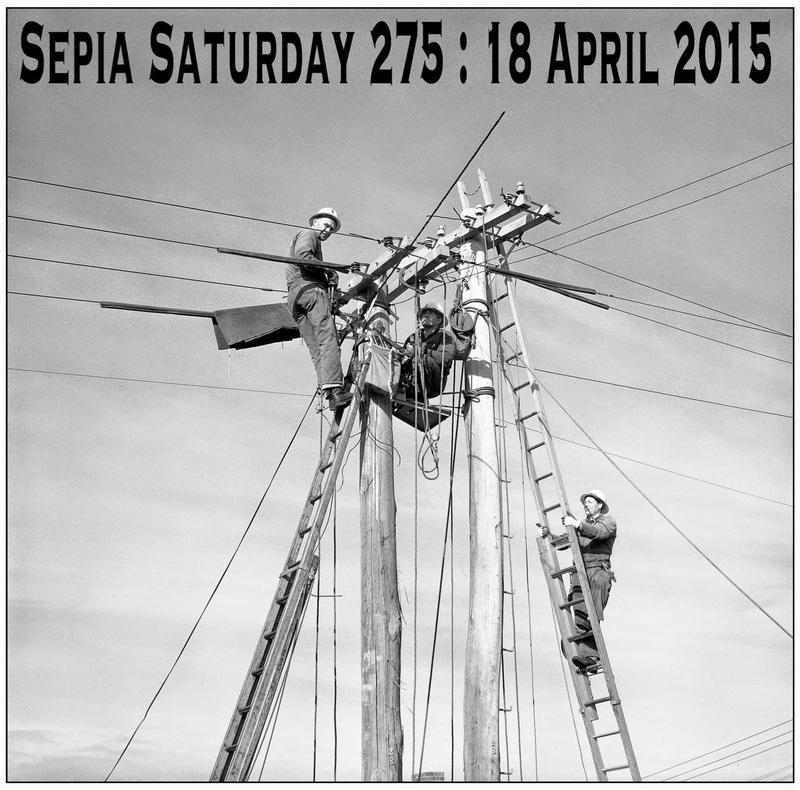 All you have to do is to post a post on or around Saturday 28 March 2015 and add a link to the list below. Before you engage first gear and plough your way to a post, take a look at what awaits you over the next couple of weeks. It's a thirsty job, this Sepia Saturday lark. Trawling through those dusty old archives, sorting through those piles of faded old photographs, looking for the perfect Sepia Saturday prompt. You can't blame a chap for wanting a drink to celebrate the discovery of the perfect old sepia print. Something long, cool and refreshing; next to a charming little river perhaps. Somewhere to go with your mates and celebrate the end of another day's honest work. Where was I? 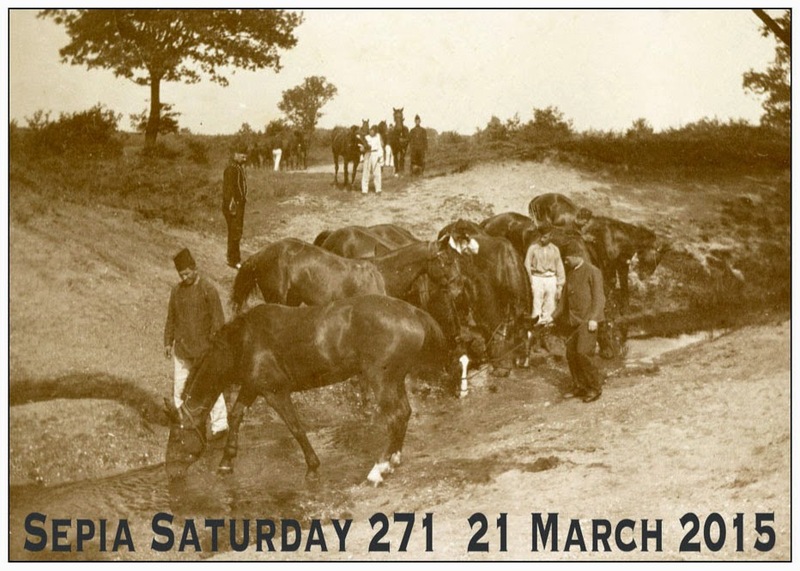 ..... ah yes, our Sepia Saturday prompt for this week - post your posts on or around Saturday 21 March 2015 - is an image from the Flickr Commons collection of the Nederlands Institute Voor Militaire Historie and shows a group of army horses enjoying a refreshing drink after a hard day's exercise. 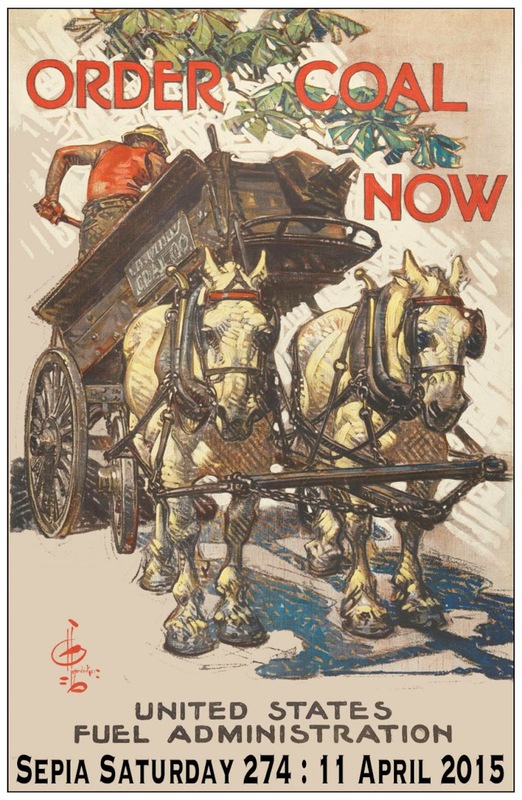 The choice of how you interpret this theme is entirely yours but drinking and horses spring to mind - or maybe drinking at the Black Horse Pub. Whatever you decided to go with, post your post and add a link to the list below. Before you drink too much be aware of the next couple of themes because both of them involve driving in one way or another. Our Sepia Saturday theme image this week comes from the collection of the Preus Museum which is the National Museum of Photography in Norway. 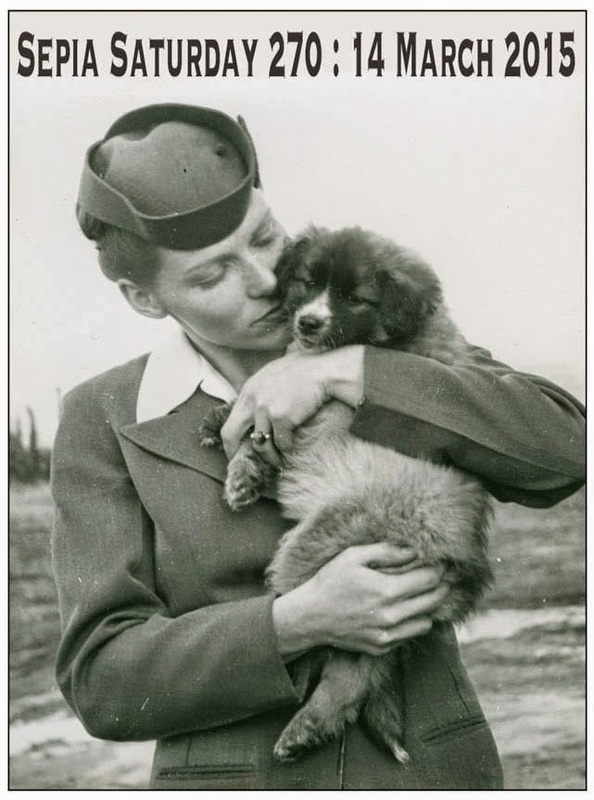 It is a photograph by Elisabeth Meyer entitled "Stewardess Hugging A Puppy" and forms part of the Preus Museum stream on Flickr Commons (you will recall that we are working the way through some of the Flickr Commons participating archives at the moment). It appears that the photograph was taken in Alaska and it dates from sometime in the 1950s. All sort of themes come to mind - dogs, cute animals, air crew, hugs: as usual it is up to you to interpret the theme in any way you want to. Simply post a post on or around Saturday 14th March 2015 and add a link to the list below. Before you go all weak at the knees with that lovable bundle of fluff, take a look at what is around the sepia corner. But now let the bleating, the purring, the whimpering begin. It is time to give your best friend a sepia hug.